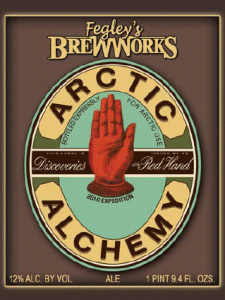 Just a heads up…there’s going to be some excellent beer on tap at Allentown Brew Works tonight. In collaboration with Beau Baden, homebrewer extraordinaire Chris Bowen’s Arctic Alchemy 2010 will be on tap tonight. There’s a huge, awesome history behind this beer, and I implore you to learn about it. It’s been written better ethere, so I’ll let them do the talking. Also know that this beer just won a bronze medal at the Great American Beer Festival, one of the highest honors a brew can get in the country/world. It’s unknown when you’ll ever get a chance to have this again so I’d suggest you get there as soon as possible for some. There isn’t a release time for this so I’m guessing it’ll be on at opening. Get there quick because there’s only 30L of it. Cheers! Woah! Very cool. Never heard of this. High alcohol content, but I’m sure it rocks. Totally into trying new beers.